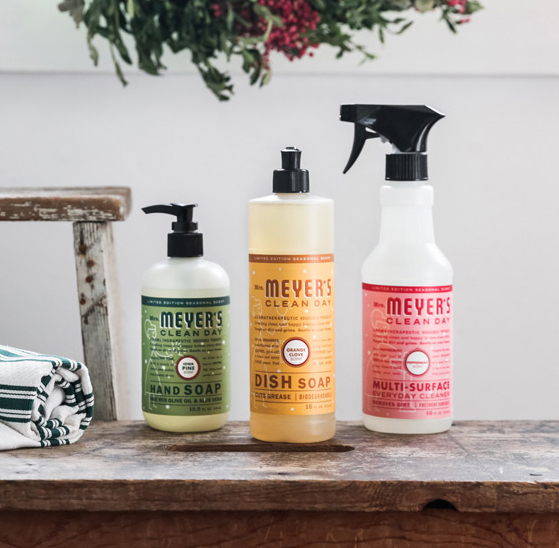 The FREE Mrs. Meyer's Cleaning Set Deal is BACK! Psssttt… FREE Mrs. Meyer’s is back! We’re in that magical and slightly maddening stretch of the year where the calendar is overflowing with holiday parties, celebratory dinners, and family get-togethers. For the most part it’s fun, but sometimes all the activity can leave me feeling frazzled. First there’s the shopping, then the decorating, and then the cooking. The list never seems to end. In those moments, it’s especially important to me that our home feels like a retreat from all the busyness. But when my house is clean, then my whole world seems a bit calmer. However, I want a house that smells good at the same time, which is why I fell in love with Mrs. Meyer’s products. I’m thrilled that Mrs. Meyer’s is bringing back my favorite seasonal scents: peppermint, orange clove, and Iowa pine. The peppermint is one of my favorite holiday scents, it’s refreshing, but not overpowering, so it’s like filling my home with the scents of the holidays. One sniff is like snuggling up with a warm peppermint mocha! Cheerful orange clove is a great stress reliever, and crisp Iowa pine has that familiar Christmas tree scent. 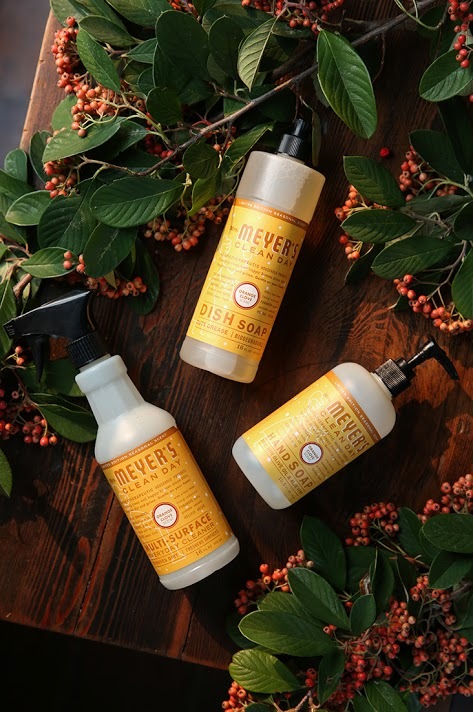 And I’m super excited that I’ve partnered with my friends at Grove Collaborative to bring you a set of FREE Mrs. Meyer’s products so you can try them, too! Existing customers will get a free set of Grove walnut scrubber sponges. They make tackling holiday pots and pans so much easier! These days, my husband is the dish washer in our house, and he’s become a convert, too! We love that all the scents come in all of the products we use every day. Not only are Mrs. Meyer’s products amazing, but the towel that comes in the set is an awesome addition. Once you submit your first Grove order using my link, you’ll also be signed up for the free 60 day VIP trial. For 60 days, you’ll save even more with free shipping, free gifts, price matching, exclusive sales and personal service — perfect if you’re trying to stretch your holiday budget! I would love to become a blogger. So hard to cone up with new topics every day though. How do yiu do it Gina? It is not easy Kimberly, I will tell you that much but it is so worth it!! Just do something that you are passionate about, work hard, be persistant and I am sure you will do just great!! Having a successful blog is hard work but it can really pay off. Go to my blog, I have several posts from how to start a blog to how to make money blogging. I hope they help you, good luck! Can’t wait for another opportunity to order Grove products. I use them (purchased in store), but didn’t order this last time. I want to start home delivery, but am waiting so that you get some credit! Let us know or me. Thanks! Thanks so much Rebecca, I know, I just love their products too! !